In the midst of moving (we got the keys to our new place yesterday! 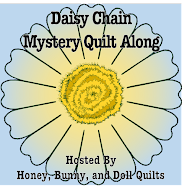 ), I'm excited to share our newest Honey, Bunny, and Doll pattern! Say hello to Ready, Set, Soar! Ready, Set, Soar! 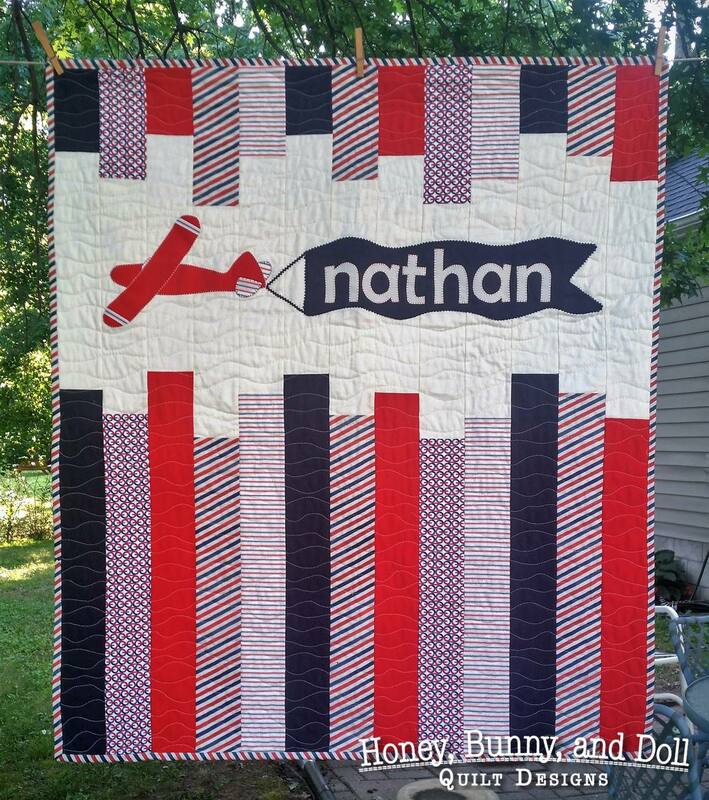 is our newest baby quilt pattern that Amanda designed for the first baby of one of her best friends. 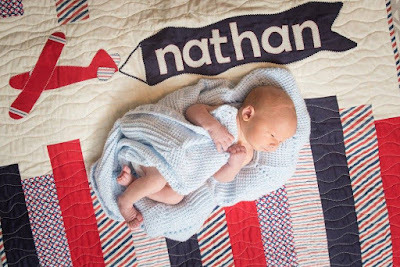 She used their airplane themed nursery to be inspired and came up with a plane carrying the little man's name on a banner! Seriously, how cute is this little guy? 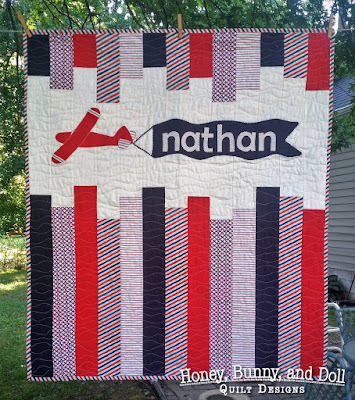 This pattern includes all of the instructions to make the quilt top as well as applique patterns for the airplane and an entire alphabet! We loved the basic "bones" of this pattern so much we keep coming up with other ideas to change up the design! 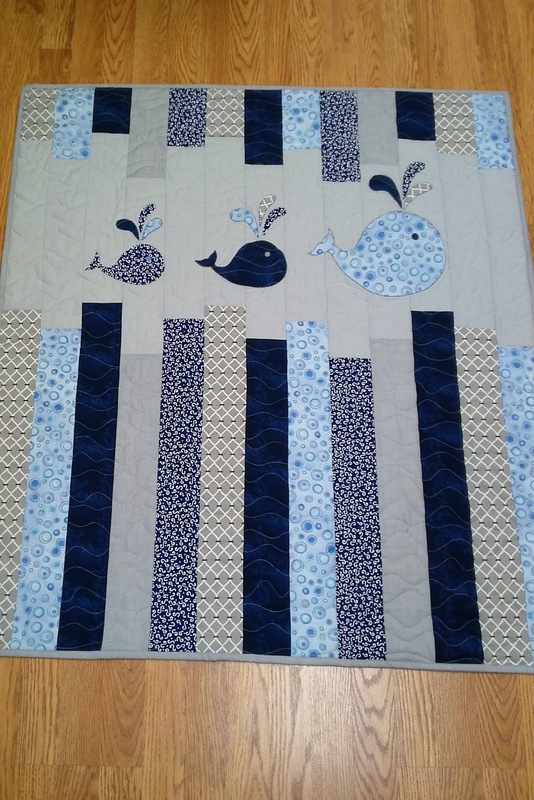 My mom took the basic quilt top pattern and added little whales instead of an airplane! 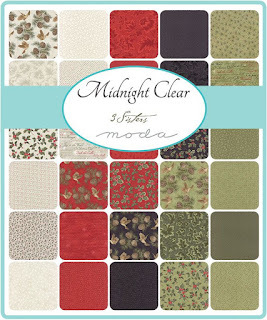 So for your pleasure we have two applique pattern add-ons to Ready, Set, Soar! 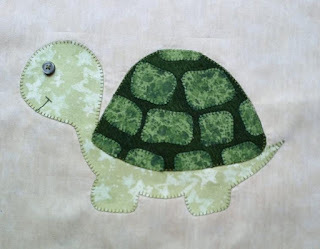 -- Whales on Parade as well as an adorable little turtle! Ready, Set, Soar! is only $7 with infinite possibilities! 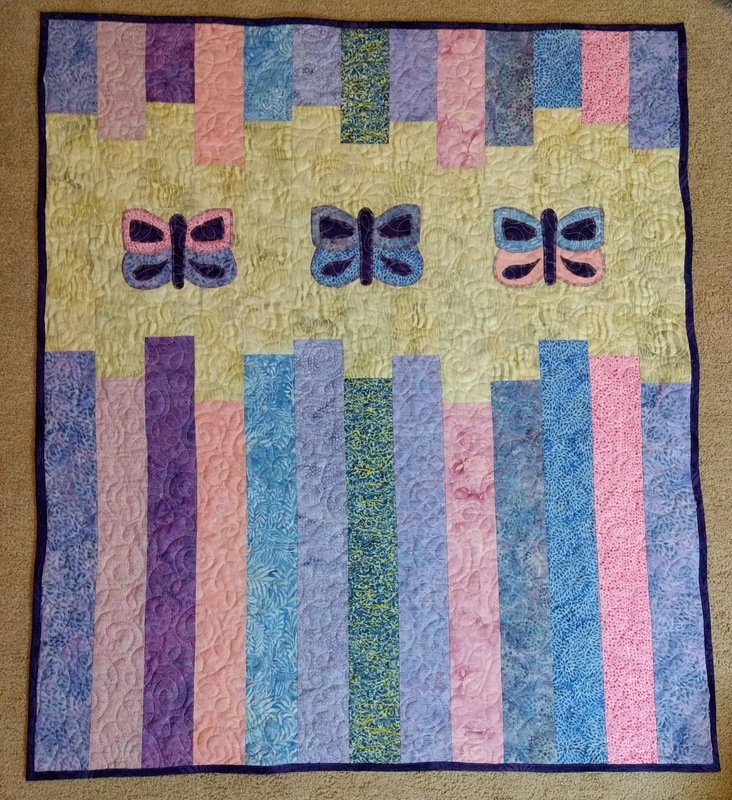 I've made two versions of this quilt -- a mermaid version and a butterfly version. Visit Etsy to purchase this pattern! Don't forget to check out our Boot Scootin' Baby pattern too on Etsy! As I've mentioned before, my husband and I are in the process of moving. I've been reorganizing my stash and trying to be a little critical of what I have so in addition to putting a few of my quilts up for sale (which is really hard! ), I'll also be doing some giveaways of some of my fabric stash, patterns, and books that need new homes. Today's giveaway is a BRAND SPANKING NEW fat quarter bundle of Midnight Clear by Three Sisters for Moda that I actually won as a part of a giveaway this fall. I'm not ready to make another Christmas quilt just yet, so hopefully someone else loves this line! Look it's even in the plastic wrap still! 1. One free easy entry for everyone: Tell me what pattern you would use this bundle with! Easy peasy lemon squeezy! I will ship this item for free anywhere in the USA and if the winner is in Canada/Europe, they will need to pay shipping. This giveaway will close one week from today, January 29th, at 5 PM. I will email the winner and update this post with who won! UPDATE: The giveaway is now closed and our winner is Margaret! Frame of Mind -- in action! A long while back, I got an email from a lovely lady named Janet asking permission to use my Frame of Mind pattern from Moda Bake Shop in the class that she teaches at a vocational school in Oklahoma! I of course immediately said yes! Janet sent me these pictures of the ladies with their quilts-in-progress! These look lovely and I'm glad to see my patterns put to good use! Congrats, ladies, on a lovely group of quilts! As always, if you've made a project from a pattern designed by me, let me know and you might see it featured here on Little Bunny Quilts! This is the last month of The Traveling Quilt Bee for my group! 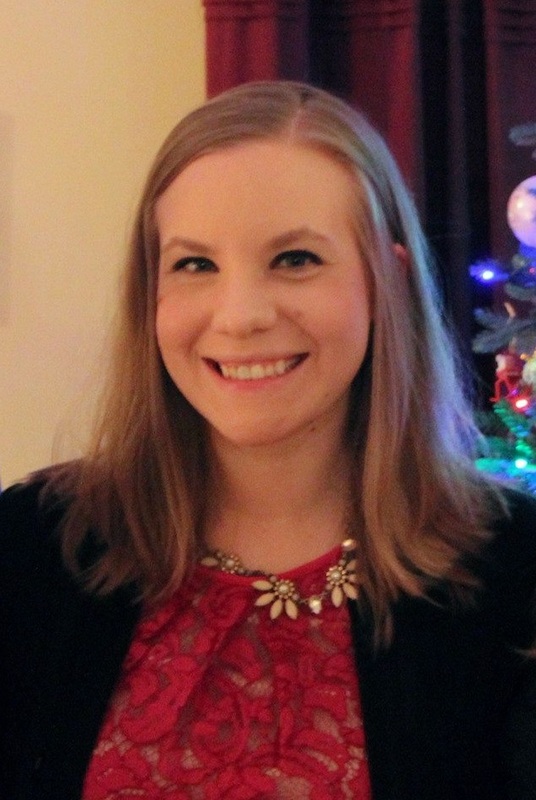 It has been a very fun process and an extremely well run bee -- thank you hosts! 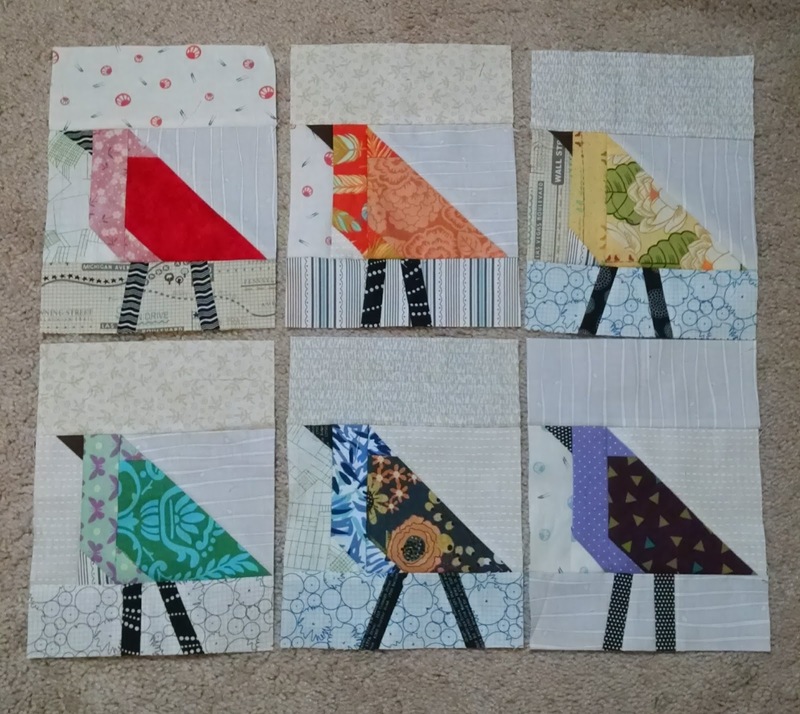 The first blocks I added were six bird blocks in rainbow colors in some of my favorite fabrics. The pattern is from the Block Lotto and it was a really fun scrappy block to make! I trimmed my blocks down slightly from the pattern so that they would fit along the length of the quilt. I really like that the legs are all different! It gives them a little more personality. My favorites are the yellow and the blue birds -- what do you think? Deciding on the second section to add was MUCH harder, but I ultimately decided to go with the Garden Snail block by Pen and Paper Patterns after seeing all of the cute snails on Instagram recently! I just love these little guys! I am so glad I broke down and bought the pattern because now I want to make lots of little snails. It was so awesome to be able to use all scraps for these blocks! Isn't it gorgeous?!?!?!?! As of right now, this quilt is 49 inches wide and 54 inches long. 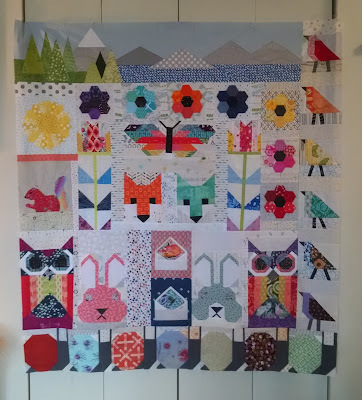 It will be fun to see how Lee finishes her quilt and see all of the finished quilts back with their owners! I don't have a picture yet of my quilt to show (sad!) but I am excited to get it back very soon! Hopefully when I get back my quilt, I will be able to share pictures of all six of the quilts. While I technically finished this on New Year's Eve, this is my first finish share of 2017! My Summer Solstice quilt is completed! I made this as a part of Melissa at Happy Quilting's Summer Solstice QAL last summer. I finished the quilt top in September with the QAL schedule, but put it aside because I wasn't ready to quilt it. 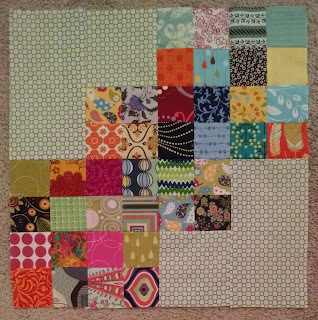 As you might have seen on Instagram, I pieced my backing and was able to do the pin basing the week after Christmas and I did all of the quilting and binding on New Year's Eve. For the quilting I did a meander with leaves to echo the leaves in the prints. 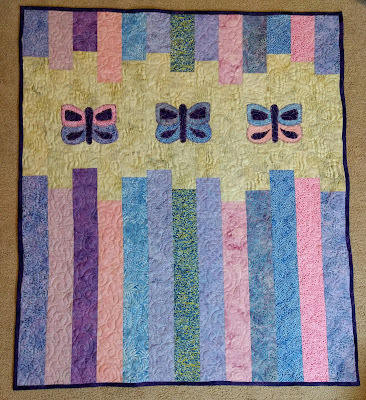 I used an orchid thread for the quilting. White thread seemed like it wouldn't bend well on the front since the background is magenta and magenta seemed like it would show up too much on the green and white fabrics, so orchid it was. I did find the exact shade that I wanted, but it did take a little bit of searching and comparing. Most of the threads were either too pink or too purple! For the backing, I pieced the remainder of the white print with a coordinating black floral print that I didn't end up using in the quilt and found an additional chartreuse print from my stash. It's always so nice to not have to buy a backing! For the binding, I didn't have enough of any of the remaining prints (originally I was going to use the black print from the backing, oops), so I used a magenta geometric print fabric from my stash for the binding. I hand stitched this one to the back while watching movies, which is one of my favorite things to do! 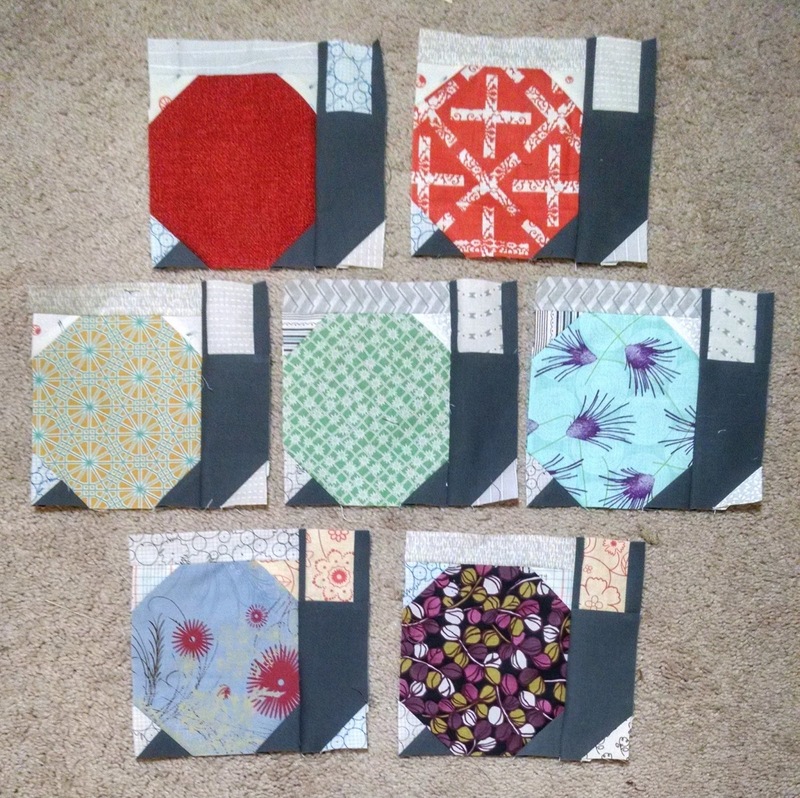 This month we received the directions for our last 12 blocks for the Meadow Mystery QAL hosted by Cheryl at Meadow Mist Designs! Despite my initial worries that my fabrics were all a bit too "medium" and that there might not be quite enough contrast, there is definitely enough contrast between the colors. If I had to do it all over again, I would swap out the teal for either a darker purple or a darker green, but I'm still very happy with it! As of right now, all of our blocks have been completed, we just have to wait and see what the final arrangement of the blocks will be! There have been many people guessing and laying out their ideas of what the final quilt will look like, and they all have been fun suggestions. Sharing at Sew Fresh Tuesday and Building Blocks Tuesday! Completed! This was the first project I worked on after establishing my official list. I completed my goal of completing the top and I will hopefully be quilting this soon. Mostly Completed! My previous top was mailed and I received the final top on December 20th. 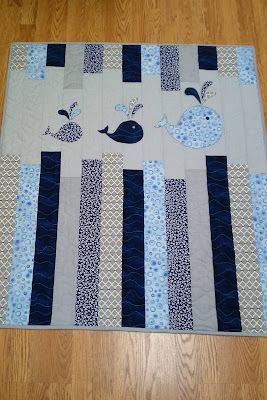 I was able to plan out what I will be doing (bird blocks on one side, fish on another) but haven't done any sewing yet. Completed! You can see my post here. 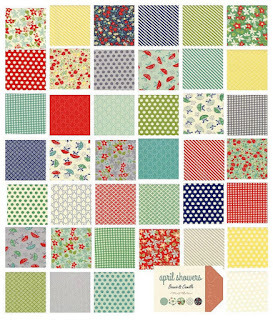 I also have received the first quilt for me to work on in January/February and have started plotting on what to make. Completed but not posted yet! This will be posted later this week! Not completed. I didn't work on this one at all. This goes to the list for January. Status: I sewed through all of the HSTs that I had cut in the midst of working on my Farmer's Wife quilt. I also cut more pink and green squares and they are paired ready to be sewn. Status: I gave six of these away! Hooray! 11. Other WIPs to be added to the list: None! Happy Tuesday! Wish me luck on my new set of goals! 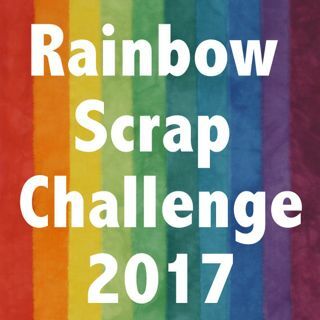 Today is the day to share our plans for our projects for the 2017 edition of the Rainbow Scrap Challenge (RSC) hosted by Angie at SoScrappy! This is a project on my current WIP list that I haven't worked on in a while. These are Lori Holt houses from an older Quiltmaker magazine and I want to try to make at least one Happy House each month. 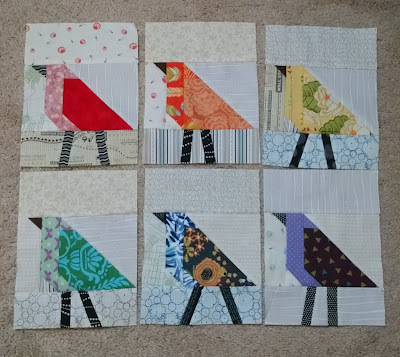 These do require light blue for the sky and brown for the roofs, so I may need to use yardage (especially of the blue) to continue with these blocks. My leader and ender project has made a lot of progress! I'll continue to work on this project all the time (since it is a leaders and enders project!) but I plan to work on it slightly more during the purple, pink, and green months -- including January! Additionally, I'll be trying to work on whatever other scrappy WIPs that I have that happen to be the colors of the month in addition to my scrappy Stash Bee blocks each month. Purple actually happens to be the color I seem to have the least of currently -- I traded scraps with a friend last year and sent her mainly purple scraps for an all-purple quilt and a good portion of the remaining purple scraps were cut into squares for my Top Spin quilt. It is a new year, so that means it's a new round of scrappy Stash Bee blocks! It's been very weird this year not being in charge of the bee after having been in charge of it for two years, and a hive mama for three years! This year I am in Hive 4 with a lot of names that I recognize, including my mom! My Hive Mama is Stephanie who was in my hive last year and was an exemplary participant and this month his her month as Queen Bee. 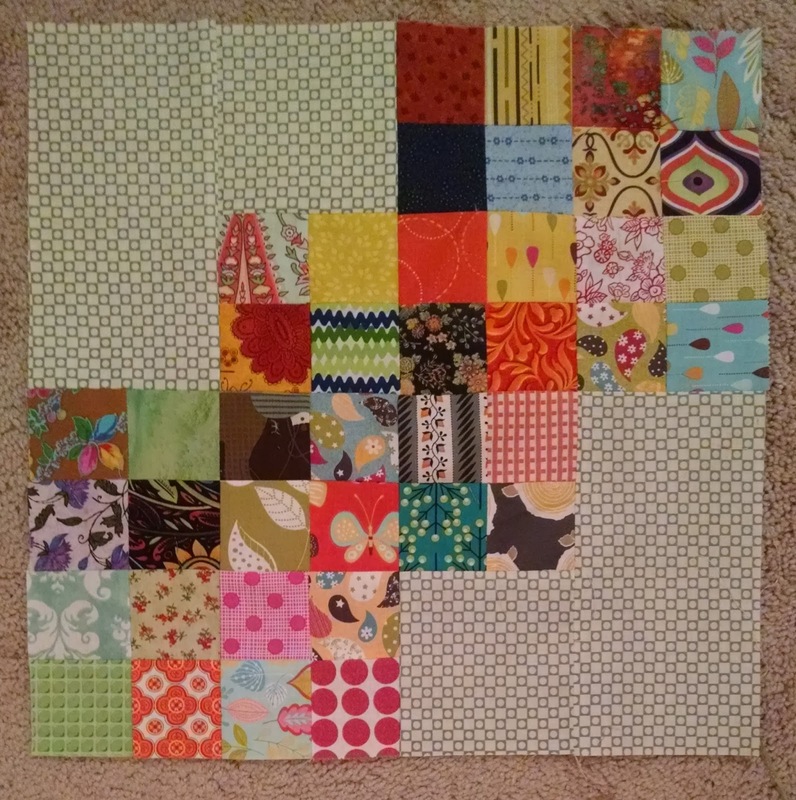 She requested blocks made of scrappy 2.5 inch squares and low volume backgrounds. You can check out her tutorial here! I made two blocks. I didn't have low volume scraps big enough for this block, so I pulled a grey and cream print half yard from my stash. I had a lot of fun sifting through my scrap bag for pieces big enough and then cutting some old charm squares that have been in my stash for much too long! Sharing at Let's Bee Social and Oh Scrap! My very good friend Audrey of Hot Pink Quilts asked me this fall about putting together a small traveling quilt bee and I immediately said yes! 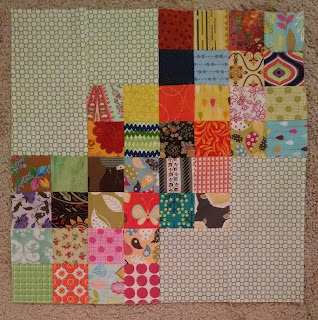 I have had so much fun participating in the Instagram traveling quilt bee this year and since it is almost over, it's exciting to start on another traveling quilt. It took me a long time to decide on a color scheme and then even more time to decide on a center motif. I knew from the beginning that I wanted this quilt to be a medallion, since my other traveling quilt is very much not a medallion. I finally settled on using a layer cake of April showers that I have had for over two years as my inspiration fabric. My intention is that my bee mates can use the layer cake as well as any additional fabrics in their own stashes that would complement the line well. Since the line is red, navy, aqua, yellow, grass green, and grey, that should be fairly easy to accomplish! My next task was figuring out what I wanted to do as my center. 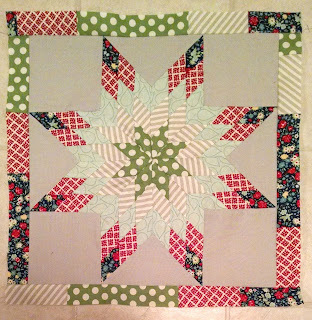 I decided on using this tutorial for a lone star block. I had to modify my cutting since I was cutting from 10 inch layer cake squares rather than from yardage, but it ended up with very little fabric waste, which is awesome! I did have to unpick the center because it "puffed" a lot. I took in three seams (the three seams holding the four quarters of the center of the star together) and it is essentially flat at this point. Working with lots and lots of biased edges does have this as a significant disadvantage, but luckily just taking in the center seams was a quick and easy fix! This is already on its way to Audrey, and Susan's quilt center is on its way to me! Isn't her rainbow center starter gorgeous? Happy New Year to you! Sharing at Building Blocks Tuesday!